In late August, some of my Young Naturalists alerted me that they had already seen hooded nudibranchs (Melibe leonina) around Port Hardy (B.C., CANADA). Late August is earlier than we historically have seen the hooded sea slugs gather in large numbers. Usually this happens in late September / early October with them beginning to lay eggs in the spring. Hooded nudibranchs back in very large numbers. Late August 2010. This week, I had the opportunity to check how many are already in the area and, it’s official – the hooded nudibranchs are very much back. To see the video from today, click here (2-minute video). For explanations on the natural history of hooded nudibranchs, please see my previous blog postings from April 10th, 2010 and May 2nd, 2010. 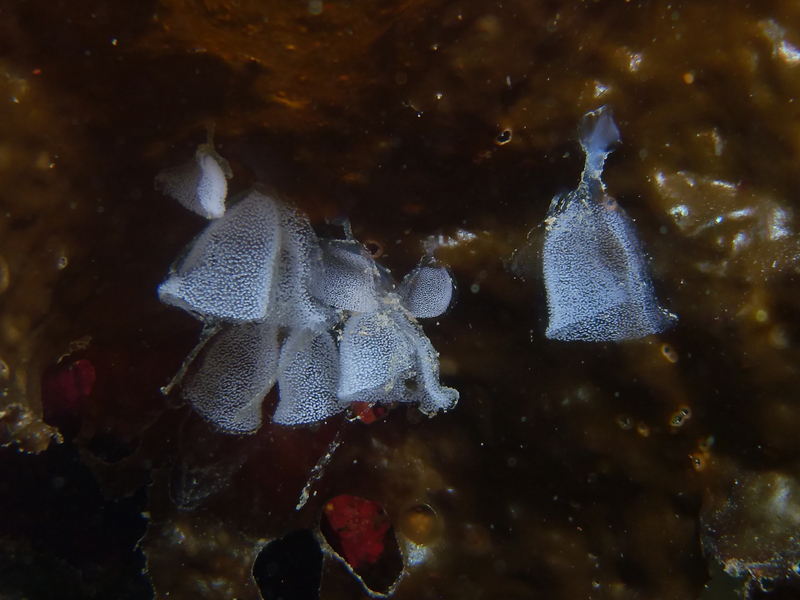 Hooded nudibranch egg masses (March 2011). Each mass is about 1 cm high. Each little white dot is an egg. 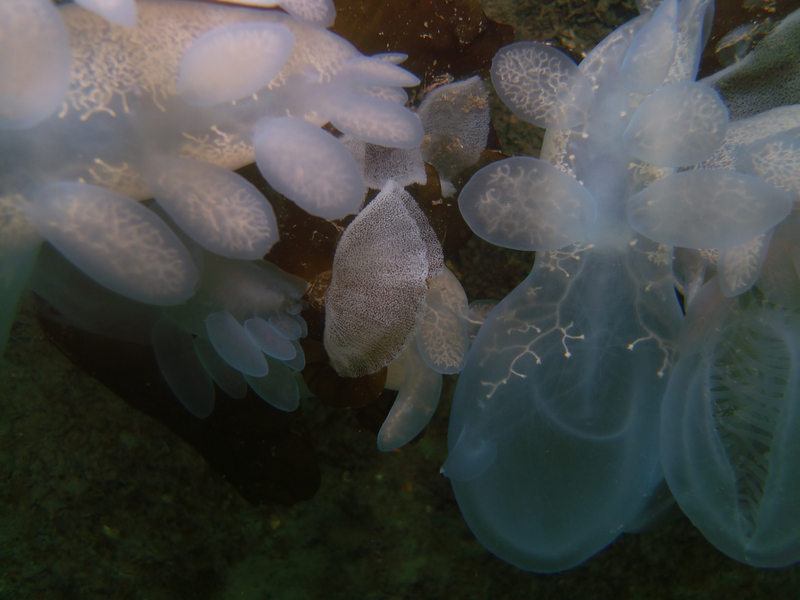 Hooded nudibranch egg masses (March 2011). Fall is here! they are so beautiful. Great video Jackie… let’s go diving! Yes! Had big camera problems and would love to see what I saw when camera was functioning properly. I am baffled by why I get that intense green in the video. J.
I remember finding my first hooded nudibranch near Orcalab. Jackie I wonder why the children in Port Hardy appreciate these creatures and would think to let you know about them? I wonder . . . . . ? Big hugs! I saw a big aggregation in mid August at an anchorage in the Tribal Group (north of Goose Group, central coast!). Are they early this year? Yay for nudibranchs and yay for you for inspiring a bunch of kids to know what they are, and care enough to alert you to their presence. Warm fuzzies to you! Hello Caitlin, Not sure what the seasonality is up further to the North but it is early for our area. I remember your telling me about seeing them with Lee and Lance and that it was even earlier than than when the PH Young Naturalists reported them. Big warm fuzzies back at you!!! Amazing video…Liam loved it. Time for some scuba gear! Most excellent! My cunning plan is unfolding perfectly . . . . I saw something like this while guiding a sea kayaking trip last week around Quadra Island – it totally blew me away, mostly because I’ve never seen it before. Paddling around the east and north side of Quadra I saw more hooded nudibranchs in one place than I thought possible, particularly along bull kelp fronds up Hoskyn Channel (between Heriot Bay and Surge Narrows). There were literally hundreds and hundreds of them on the kelp, all over each other and apparently laying eggs (lots of spiral rose petal-like pale yellow egg cases). Further north past Surge we saw plenty of them free-swimming, but not in the same big aggregations or numbers as in Hoskyn Channel. Rick, this is of enormous interest. I have no idea what this density and early arrival of hooded nudibranchs is an indicator of. It is of great value though to know how widespread “the phenomena” is. I checked yesterday and I could not find any eggs yet up here. The fact that you may have them there is of particular interest to me. For those who wish to see what the eggs look like, go to the link below. These reports of the hooded nudibranchs are the first time that this blog is serving as a potential “pooling point” of sightings/data. I am going to pass on our observations to the international Sea Slug Forum. If you are able to get shots of the eggs, that would be fantastic Rick. Thank you! Mijn complimenten voor deze mooie foto’s! Ik moet denken aan de kalender die je voor m’n moeder had gemaakt. Mooie kwaliteit en echt bijzonder wat daar onderwater allemaaal te zien is.